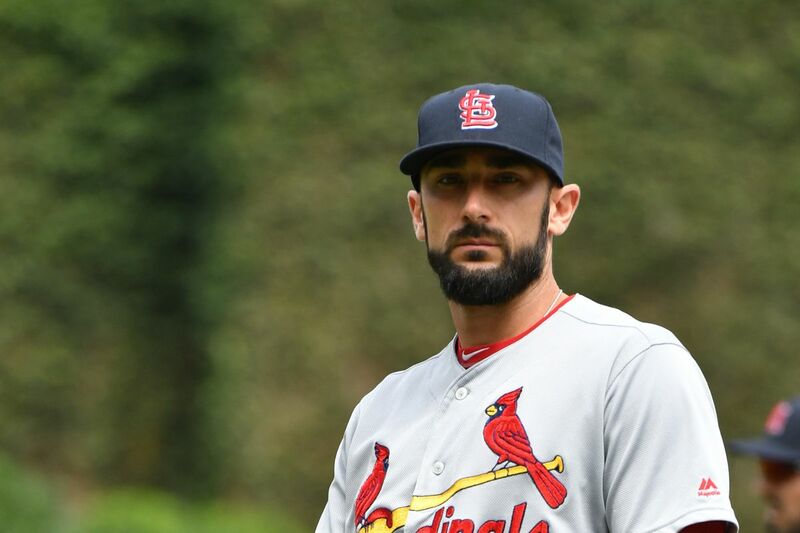 Being born to a father who coached high school baseball teams and by a mother who played softball, there was no questioning on whether or not Matt Carpenter will take a liking to the sports. Matt not only took a liking to baseball, he went on to carve a career out of it and has been successful since then plying his trade for the various baseball club sides he has played for, more especially his current team – ST. Louis Cardinals. Here, let’s find out other details about him that are not commonly known, we will also give you a balanced reading by telling you all about the woman who has been behind his successful career in addition to reporting his most recent career stats and biography. The professional American baseballer was born on November 26, 1985, and named Matthew Martin Lee Carpenter. His birthplace was Galveston, Texas as a son to Rick and Tammie Carpenter. His father played baseball in college and later turned to a high school baseball coach when they relocated to La Marque, Texas. He coached La Marque High School before moving to Lawrence E. Elkins High School then to Prosper High School near Dallas where he currently is. Matt Carpenter schooled at Elkins High School, played baseball and was named a 2004 TPX second-team High School All-American in addition to holding the Elkins High School record for most career hits. After high school, he proceeded to Texas Christian University (TCU) where he majored in communications and made his mark playing for his varsity baseball team. Matt was named second-team All-Mountain West Conference in 2006, 2008 and 2009. He got drafted to the St. Louis Cardinals in the 13th round of the 2009 Major League Baseball draft with a bonus of $1, 000 bonus. For his pre-MLB seasons, he played for various A-level teams like Batavia Muckdogs, Quad Cities River Bandits, and the Palm Beach Cardinals batting a total of .283 with hitting two home runs and 22 RBI. For his impressive performance at this level, he got called up to the Springfield Cardinals and had a successful 2010 season emerging Topps’ Double-A All-Star, Texas Mid-Season All-Star, Texas Post-Season All-Star, TCN/Scout.com Cardinals Minor League Player of the Year and Cardinals organization Player of the Year awards for 2010. Matt Carpenter made his MLB debut on June 4, 2011. He was with the St. Louis Cardinals when they emerged World Series Champion by defeating the Texas Rangers. Despite not being active at this time, the Cardinals gifted him a championship ring. He has since then emerged as one of the best players in the team performing stupendously well whenever he is called up to play. Matt has for keeps a National League championship title earned in 2013, 2015 (3rd) Baseball America National League “Best Strike Zone Judgment” award, Major League Baseball All-Star award in 2013, 2014, 2016, National League Player of the Week Award which he has won 2 times on April 19, 2015; June 6, 2016 and a Silver Slugger Award at second base he got in 2013. There is no doubt that as Matt Carpenter continues to advance his career, his performances will improve beyond what we have already seen. Matt Carpenter is married to the love of his life Mackenzie Carpenter. The two got married in 2011. Mackenzie Carpenter was born on January 7, 1988, to Mrs. Nancy Goodman Detmore and Paul Detmore. They met while studying at Elkins High School and took a liking to each other. Their relationship continued even while in college and on Friday, May 6, 2011, Matt proposed to her with the result of her response being a wedding ceremony which held on December 10, 2011, in Missouri City, TX. Mackenzie works as a 6th and 8th-grade Physical Education coach at Fort Settlement Middle school. She is also an active member of the Cardinals Wives organization. Matt and Mackenzie’s union has been blessed with the birth of 2 children. They had their first child a baby girl born May 25, 2016, and named her Kinley Rae. After her, they gifted her a younger brother on November 20, 2017, who is named Kannon Lee. During his high school days, his friend and now wife gave him a frame of his childhood hero and later teammate (2011-12) – Lance Berkman. Matt Carpenter is known for not wearing batting gloves during baseball games and for this, his right hand bears evidence of many calluses and cuts. Well, sports people normally one have one thing which they feel gets things going in their way. Perhaps this is his. Matt pledged in the summer of 2017 to donate $10, 000 to flood victims of Hurricane Harvey at Greater Houston for every home run he hit in the remainder of the season. He bats with his left hand and throws with his right hand.